200 hr. Registered yoga teacher ( RYT) Vinyasa yoga style. Certified through Boston Yoga School at Orleans Yoga, Cape Cod: Director Ame Wren, Co-director Petra Ledkovsky. Along with the amazing guest teachers: Kevin Courtney, Zack Dacuk, Chip Hartman, Terry Cockburn and Brenna Matthews. Radiant Child Yoga for children Certification, May 2016. Mother of 4 beautiful children, animal and nature lover, hiking, paddling the waters, crafting, and sunshine are just a few of my passions. My movement experience began with ballet at age 5 and competitive collegiate gymnastics. I progressed to become a business owner/coach of a successful gymnastic fitness facility, to what is now my passion, yoga. I began my yoga journey in 2006 as a favor to my best friend to try a yoga class. It was very different than the competitive, perfectionist atomosphere I was used to. Contrary to my belief, I felt better, I felt something good when I left class. After taking my class, it is my hope that you will, too. 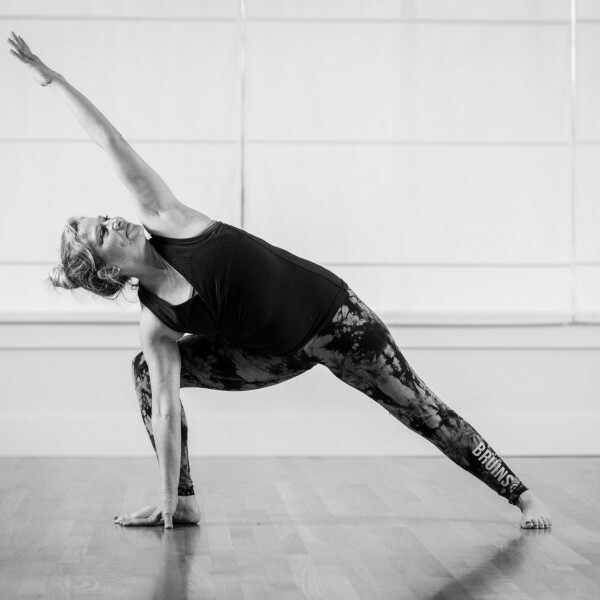 Please join me for a fun/energetic yoga class as we learn the balance of yoga together. We will explore the free spirit of knowing one can do the unthinkable with the simple task of just trying something new and following one’s heart. Read a Q&A with Anne here.